At SmallPaws daily exercise is complimentary. The exercise areas are covered to allow playtime in all types of weather. All of our accommodation is also air-conditioned and heated. Complimentary Pampering included for every cat! 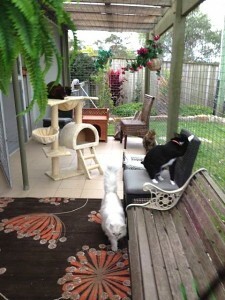 At SmallPaws we want each of our cat hotel guests to feel at home and settled as soon as possible after their arrival. We offer high-quality pet accommodation for cat lovers who truly care about their pet’s comfort during their stay. 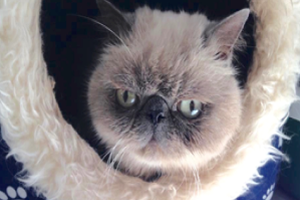 At SmallPaws, we ensure that our luxury cat boarding offers your animal a friendly and welcoming environment. Every cat has their own preferences and personality so our cattery attempts to cater for all types. Small Paws ensures your cat is provided with fresh air, water and a meal plan to suit their needs. Any social animals will be allowed out into the community play area, where they can stretch their long legs and pounce across the enclosure. We also have a separate exercise area for less social cats. 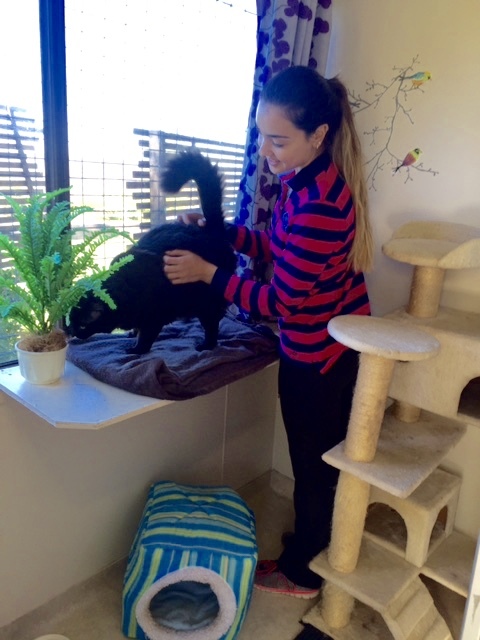 Keeping your pet active helps to maintain their happiness throughout the duration of their stay in our luxury cattery near the Northern beaches. As we all know, cats don’t have owners and carers … they have ‘staff’. Every morning starts off with ‘the staff’ checking every cat with a cuddle, scratch and toilet check. Food and water consumption overnight is also monitored. Morning medications are then dispensed, and breakfast for those who need it. 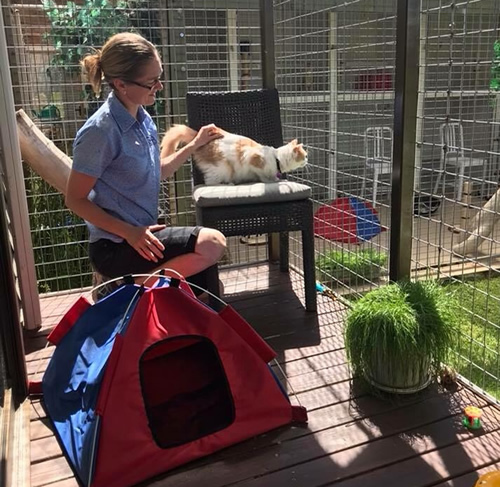 In The Apartments the sociable cats are then let out into the “sociable” exercise area of our cat hotel, while the not so sociable cats are let out one at a time into the ‘non sociable’ exercise area. In The Penthouse we let out one cat at a time to explore the balcony, or have them out with some of their neighbours if they are social. There are some cats who prefer the comfort of their own room; these cats are monitored closely for issues and encouraged over time to venture into an exercise area. After all the rooms are cleaned and fresh litter trays replaced, fresh wet food, and fresh dry food is given to each cat. The trays are cleaned as needed, and exercise times rotated as necessary throughout the day. During the afternoon there are more cuddles, ‘health checks’, pampering plus activities complete (optional extra) along with some sleeping and playtime. Late afternoon it’s back into the rooms for rest and more cuddles. Evening medication is then dispensed and a final good night tuck in. 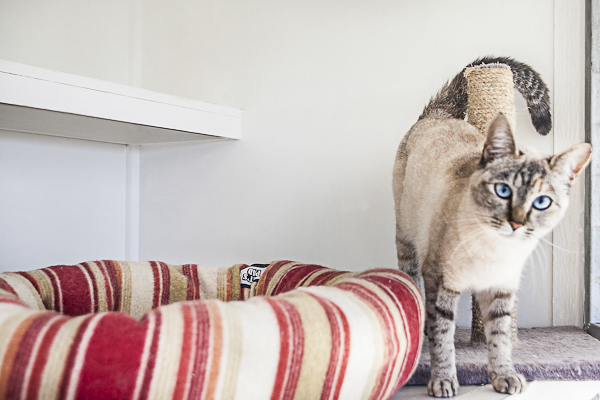 We offer two levels of accommodation in our cattery, The Apartment and The Penthouses. Whether you are dropping your pet off for a short trip near the Northern beaches or you are heading overseas for a few months, we have two solutions for you. MENU: Cats in both levels of accommodation have a choice of Whiskers tinned variety, Fancy Feast, Majesty, VIP Cat fresh meat, Tuna and Supercoat biscuits. In The Apartments each cat has their own double enclosure connected with a cat flap. The side walls to the enclosure are solid, and each ‘room’ has a hiding box and soft bed. One side of the enclosure is on the inside of the cattery, and the other half is on the outside, where each cat can enjoy fresh air and views of the garden (and wildlife!). The inside of the cattery is heated and air-conditioned. 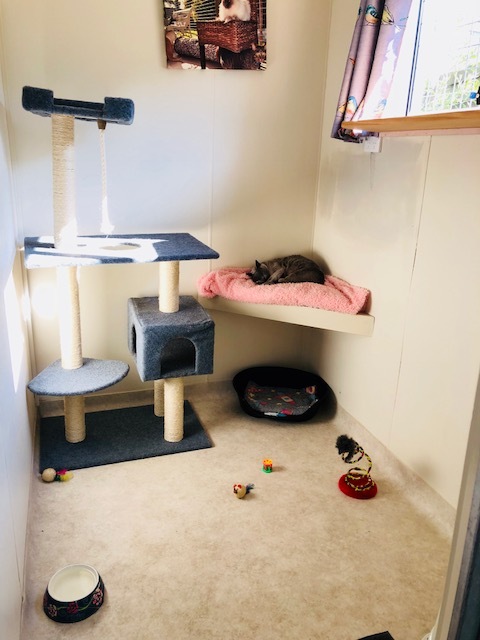 In addition, there are 2 fully enclosed exercise areas with large scratching poles, comfy beds and lots of toys where cats can take their turn for two hours a day running around, exploring and getting closer to nature. Cat grass is available in each exercise area. Tailored for those who want an opulent experience for their pampered feline friend, this package is the epitome of luxury cat boarding. In The Penthouse we have four large individual suites, each with a cat house tree condo, comfy bedding, a window and climbing shelf. The Penthouse is fully air-conditioned and heated. Heat pads are also provided complimentary in the colder months. Each cat has two hours access to the fully enclosed balcony which overlooks the garden and wildlife. The balcony has comfy beds, a chair to climb on, lots of toys to play with and a pot full of cat grass. They can spend their time exploring their new surroundings or just lazing in the sun in a comfy bed.